Allied invasion barges, laden with commando troops, are shown rolling up to the beaches of Dieppe. On the barge on the lower left, one of the commandos can be seen standing while another crouches beside him. This Wirephoto picture was sent from London by radio. Rob Alexander collection. Abandoned at Dieppe by British. 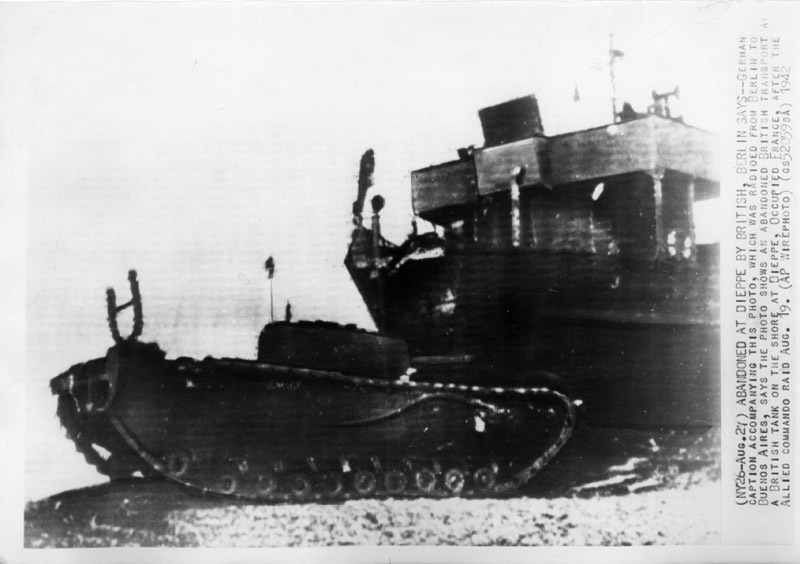 Berlin says: German caption accompanying this photo, which was radioed from Berlin to Buenos Aires, says the photo shows an abandoned British transport and a British tank on the shore at Dieppe, occupied France, after the Allied commando raid Aug. 19. (AP wirephoto 1942). Rob Alexander collection. My thanks to Will Ward who pointed out that the house my grandfather used as his Regimental Aid Post while in Seaford, East Sussex England, during the spring of 1942 still stands and is relatively unchanged. The garage has been rebuilt and the yard looks much nicer, but otherwise, it is the same house. The bay window is still there, as is the wall along the sidewalk and the the little peaked roof over the front door. I love the convergence of past and present. It provides context and a connection to a place and a time. And when we get bulldozer happy and start knocking down all of our old buildings, we lose a sense of ourselves and our history. These buildings act as place markers. They’re a reminder of what has come before: In this case, Canadian soldiers using these houses along Downs View Road in Seaford as billets; home away from home. Here’s a selection of photos of my grandfather’s RAP, from both the present (courtesy of Google Streetview) and the past. 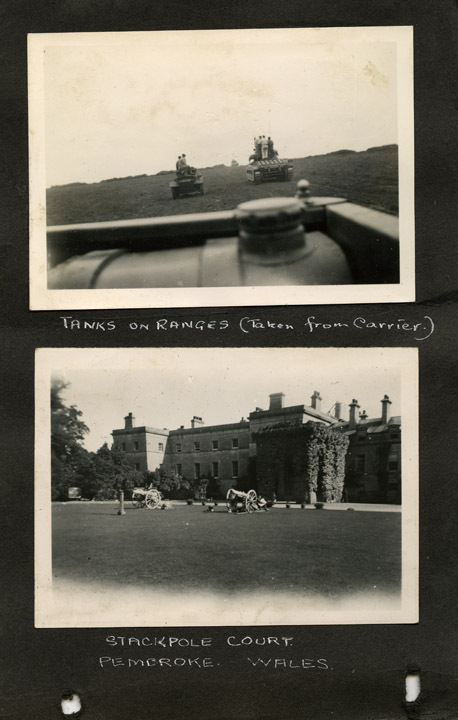 Below is a pair of photographs taken in September 1942 while the Calgary Tanks were training in Wales with the corresponding journal entries. Tanks on the ranges at near Stackpole Court in Pembroke, Wales in Sept. 1942. Alexander family collection. The last day of the old year – a year which began with disaster, but ended pretty well. I wonder what 1943 will bring. Will it return us to our homes… I wonder. This evening I am going out to see the old year out and the new year at the Spofforths. Will go to dinner at 8 p.m. and then spend the evening there. Just listening to a Scottish concert on the radio. This is their day to howl. Went down to Spofforths and had New Years dinner. Tenderloin steaks, fried onions and chips. A glorious meal. After dinner four of their friends came in and we saw the old year out and the New Year in. I was called home right after this to suture Sgt. Havard who apparently had got into an argument. Today is as usual – am busy getting R.A.P. in shape for leaving and getting my stuff packed. Will meet Timmy in Grosvenor Hotel tomorrow for lunch and we will proceed north together. One week Monday am being entertained in London by Mr. and Mrs. Spofforth. The Regimental Dance is over – tonight I am certainly going to hit the hay very early. Nothing much to report today. I sat around and talked to Parley until nearly midnight. We had our 2nd Xmas dinner at Harrison’s in Seaford. Isn’t it strange to be at the same house for a Xmas Dinner in England, twice in succession. We had a very lovely time. Got up early this a.m. and Jim (Furman) and I drove to Ford Manor to a Gas Course. For a one day course is was very good, but we nearly froze to death. Timmy Cameron and I are starting for Scotland on Saturday morning. No plans beyond that yet. Tonight is regimental dance – will have to show up but am going stag. These social activities are getting too much for me. General clean up today. Am very happy today – at least I have succeeded in getting two stripes for Jim – he is a Corporal and very happy. John, Stoney, Dave Clapperton and I go over to Harrison’s for dinner.